In my time as a Fangirl, I have loved a lot of things. When I started reading I fell in love with books, I fell in love with the Harry Potter series, with Lord of the Rings, with Disney, and many other things. But I’ve never loved a comic so much that I was actually saddened to see it end. With graphic novels, I’ve felt that the complete story ends so well, that it isn’t a huge deal when it ends, but with this Wonder Woman comic, I’m very upset that it’s over. I’ve read these final five issues several times, and there is no way my overview will come even mildly close to showing you how lovely this series is, so take my words with a grain of salt and please go buy this series. Trades will be out soon, so you can get them without ads and just the full story please go get it. But now, it’s time for war. The Amazons are prepared for battle, and Hephaestus has brought their brothers and sons home, to Paradise Island. First Born has taken over Hell, and works to do the same to Life, Demeter’s realms. He succeeds, so Demeter goes to Paradise Island with Hermes, Eros, and Artemis. Diana stays behind to cover their exit, and First Born takes her back to Olympus. There, he asks for her hand. He feels she is the only one worthy to bear his children, and therefore the only one who deserves to continue living. She denies him repeatedly, and when he has had enough, he stabs her in the side and leaves her to watch the Amazons die for her. 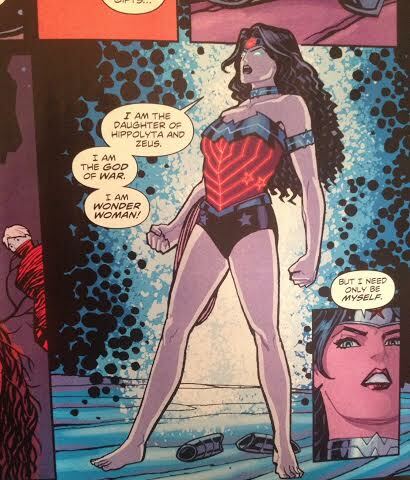 Strife brings her back to Paradise Island, because she knows the fun isn’t over, and there they find that Queen Hippolyta has been raised as a stone Golem to fight with the Amazons. Hermes takes Zola, Diana, and Zeke to Olympus to fulfill the prophecy. First Born follows them, and when Diana asks him to treat Zola and Zeke mercifully, he refuses. She sends him down the pit to (I believe) Tartarus, and Zola brings Zeke to the throne. The prophecy is correct, and Zola explains it all. She is actually Athena, Goddess of Wisdom, born into a mortal body. Zola is unaware of Athena’s influence; they are separate even though they share a body. As Athena is about to destroy the Zola part of herself, Wonder Woman prays to her to keep Zola, as she is strong and powerful and caring. Athena does, and goes into her owl form, separating herself from Zola forever. She had explained that Zeke is actually Zeus, and he is back in his rightful place; the throne of Olympus. I got chills reading this, Fangirls. This series is just so dang amazing. I was not into the Future’s End comic, though, which was a bit disappointing. In it, Wonder Woman is fighting a war, rallying troupes, and the like. It ends with Superman asking her for her help, and says that if you want the ending you have to read Superman’s Future’s End comic, but since I don’t care for him or her Future’s End, I didn’t buy it. To be blunt, I hate Superman and don’t like seeing them together. So. 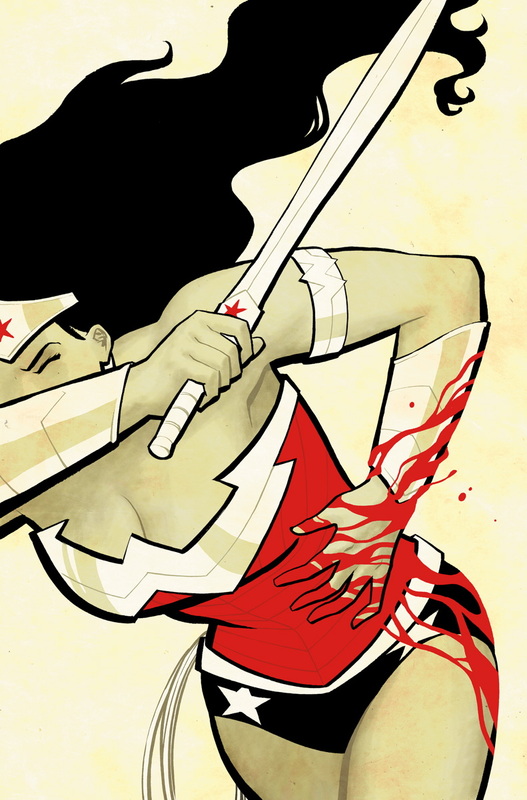 But Brian Azzarello and Cliff Chiang’s Wonder Woman is one to worship. She’s well drawn, damn powerful, and sassy as hell. I loved it, and I’m quite upset that it’s over. So Fangirls, go read it, and reread it, because it’s amazing and I want to soak up every piece of it.